Coming off the December correction, the broad equity market has quickly and significantly improved. At this point, we would not be surprised to see the market take a pause to rationalize economic growth expectations, which have been steadily declining. While our signals do not suggest a high risk of recession in the near term, this rationalization may take time given the pace of the stock market recovery. 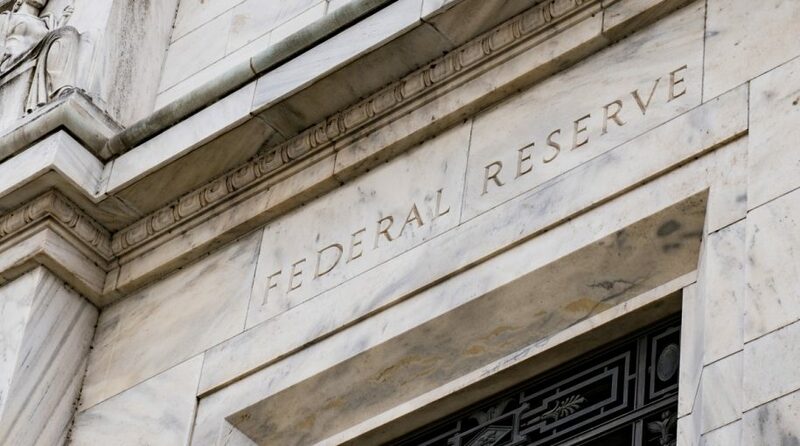 The U.S. Federal Reserve has effectively shifted from a tightening monetary policy to a neutral policy. Additionally, China seems to also be moving to a more stimulative regulatory environment, and the decline in the pace of economic growth in these regions may be bottoming. In fact, the pace of global economic growth accelerated in February. 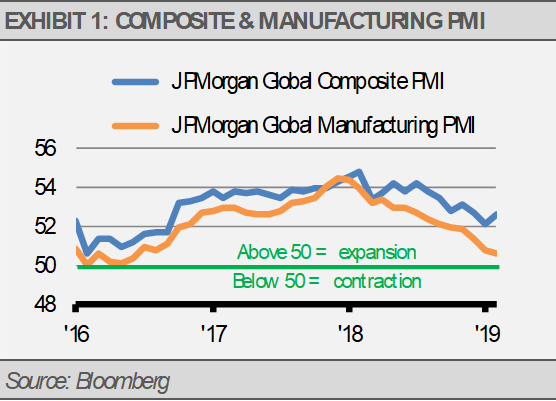 According to the J.P. Morgan Global Composite Output Index, while manufacturing is showing signs of weakness, other areas, such as financial services, business services, and capital goods, are strengthening. With the U.S. Federal Reserve’s pivot to a neutral policy, we may have seen a peak in the U.S. dollar exchange rate. A weakening U.S. dollar combined with a decline in bank reserve requirement ratios in China supports an optimistic view for China and emerging Asia more broadly. 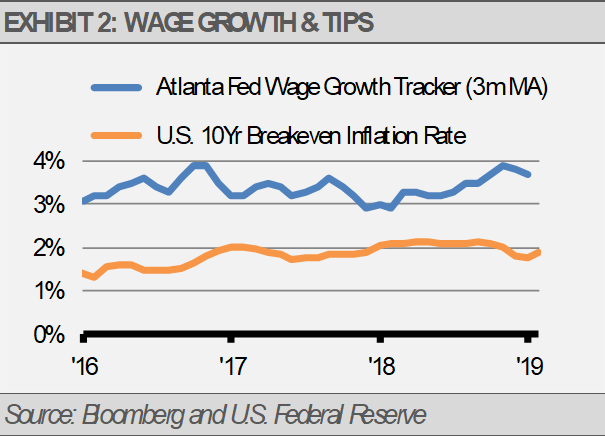 These factors build on fundamental strength coming from rising U.S. employment and wages coupled with tame inflationary pressure as measured by the 10-year Treasury Inflation Protected Securities (TIPS) spread. Our view is that economic growth in the U.S. and China will stabilize at more sustainable and constructive rates. This growth should push corporate revenues, earnings, and stock prices higher over time. Any positive developments on U.S.-China trade negotiations would be a bonus to this view. 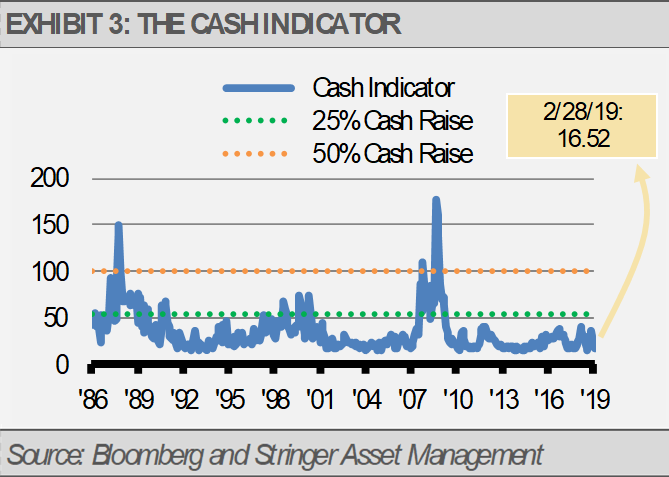 The Cash Indicator (CI) has fallen precipitously since December’s volatility. From these low levels, volatility is likely to return as markets do not move in a straight line. This expectation is consistent with our fundamental view that the global equity markets are due for a pause. Still, the CI is far from suggesting significant risks in the near term.